July 2011: Someday I should get back to this. When I do, I think I will not add coloring, it will have lye, olive oil, cocoa butter, coconut oil, castor oil, and hopefully almond scented oil. 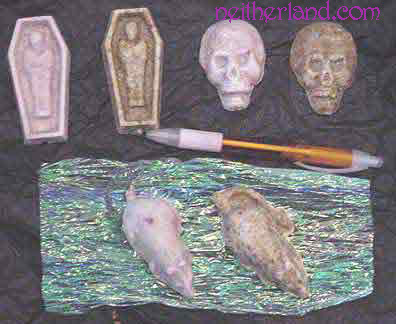 Shapes will include but are not limited to: rat, mummy coffin, fairy(! ), spiderweb, plain bar, small decorative. The ones pictured below are from the original 1999ish batch. They are vegan, made from scratch with base ingredients of lye, olive oil, and cocoa butter. The soaps are 100% usable and safe for skin, I wouldn't try eating them even though they smell so yummy! What you see in the picture are 2 different batches, a skull, a coffin with mummy, and a rat from each batch, I also have a few spider web ones. The tan/yellowish colored ones are peppermint with actual dried peppermint both herb and oil in it, it's very cool and refreshing feeling, great for summertime, gives me a chill in the winter, natural coloring only in that batch. The whiter ones are vanilla scented, I tried to make them purple but they came out very pale pink, and they have glitter in them. You can have one or 2 of these free if you want, they seem to work ok but they have a powdery coating on them I'm told is soda ash. It's not harmful, I'm still researching why this happened because I want soaps that can sit as decorations for many years. May 2007: I'm not sure if the paypal cart works correctly right now, best to contact me. At your preference you also may email me with what you want. you can contact me directly and let me know what you want and your zip code and I will get back to you asap. Please see this page for policies and shipping info. If you are not in the U.S. please contact me instead of using the PayPal cart. As you add items to the cart please check that prices are the same, if you see a difference contact me, the price listed on the site is what you should pay. Most orders are $3 shipping for the first item (or up to 4 comic books) and $1 for each additional. At my discretion I may refund some shipping charge if it is extremely higher than actual shipping & handling cost. Pricing: For now I'm either giving away free samples or charging $1. Set of 3 of your choice for $5, shipping $2 anywhere within the U.S., higher rates apply to other countries. 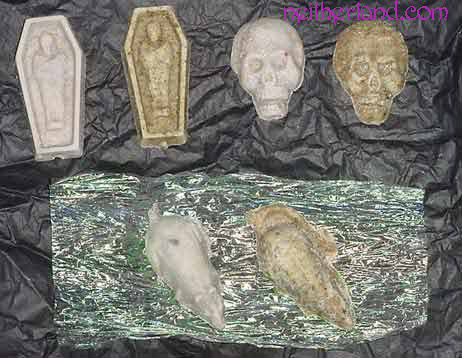 I also have some not pictured, they are small dome shapes, made in egg cartons so picture that shape & size. Those are 4 for $5 and I will add one to a set of the other 3 for $.50. This picture is lower resolution but I stuck in the pen to show the size of them, they are fairly small.